Published: Dec. 6, 2017 at 01:37 p.m. Updated: Dec. 6, 2017 at 01:51 p.m. There's not much debate about who deserves to win the 2017 Heisman Trophy, which will be awarded on Saturday night. Oklahoma's Baker Mayfield cranked up his game this year despite losing his top WR (Dede Westbrook) and two highly talented RBs (Samaje Perine, Joe Mixon) to the NFL. The Sooners' Big 12 title win locked up a CFB Playoff berth, as well as a Heisman for their QB. The race for next year's Heisman is already underway. Players that performed well late this season planted an earworm in the minds of the Heisman voters, giving them some momentum for next season. Here are my picks for the top 10 2018 Heisman Trophy candidates. I'm taking several players out of the equation because it's unclear if they'll return to school or apply for early entry into the 2018 draft. For example, USC's Sam Darnold and Ronald Jones would be in the mix for CFB's top individual honor if they return to lead the Trojans next fall, but they haven't stated their intentions for 2018. Bosa's been a force for the Buckeyes this year and will need to take over a leadership role in 2018 with the departure of senior ends Tyquan Lewis and Jalyn Holmes. 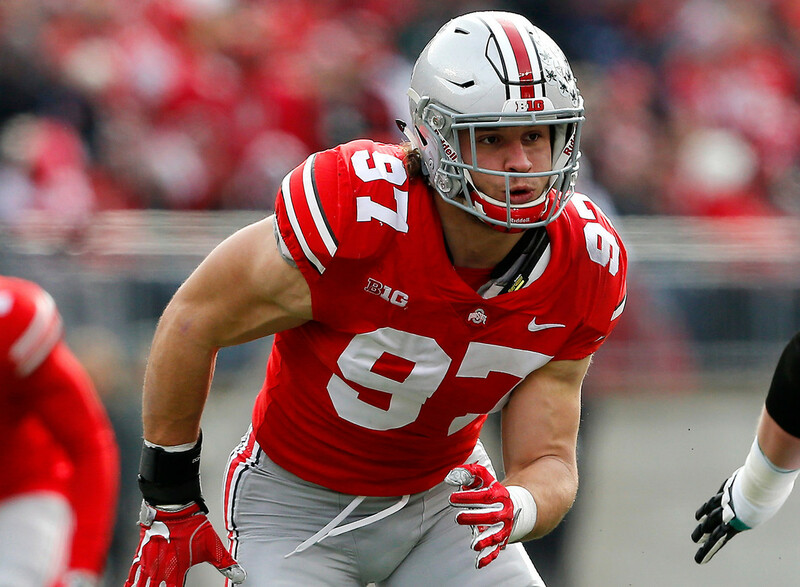 Bosa has power, quickness, and a non-stop motor. He'll be fun to watch -- unless you're trying to block him. The Badgers surprised many pundits with an undefeated regular season, and Thomas, a true freshman, became a breakout star. He should again get most of the work in the backfield (he had 1,847 yards on 273 carries in 13 games this year) because his powerful lower body allows him to run through tackles and explode into the open field when finding a hole. Tate was one of the most exciting discoveries in college football this season. He ran for more than 130 yards and at least one touchdown in a six-game midseason stretch before slowing down in road games at Oregon and Arizona State. Tate also threw for more than 150 yards four times as a first-year starter, showing potential as a great dual-threat quarterback. Rich Rodriguez will utilize the young man's talents fully in 2018, but he'll need to become a more consistent passer and the Wildcats will need to win more than 7 games (7-5 this season) if he's going to be a top Heisman candidate. I expect Haskins to break out in his redshirt sophomore season. He flashed Heisman-type talent in the team's second-half comeback against Michigan last month when filling in for an injured J.T. Barrett. Haskins has the arm strength and quick release to be a more effective thrower than Barrett, as well as the mobility to run for long gains if defenses aren't spying him. Urban Meyer and his staff have had two years to coach Haskins up, and there is a lot of young receiver and running back talent (RB J.K. Dobbins could be listed here, as well) returning next fall. To earn the respect of Heisman voters, Hurts needs to improve as a passer. He follows Nick Saban's formula of not turning the ball over through the air, throwing only one interception in 12 games this season. But Hurts threw 222 times for 15 touchdowns in 12 games -- those are not Heisman numbers. Nonetheless, he is a tough competitor who picks up yards on the ground, too. If Alabama makes another title run in 2018 and Hurts makes more plays through the air, I believe he'll be in the hunt for the Heisman. A defender on a Group of Five school has little chance to actually win the Heisman. But there's no reason he couldn't end up a finalist like Ndamukong Suh did in 2009 as a star for Nebraska. Oliver is a whirlwind with power on defense, forcing the action inside and chasing ball carriers outside. He will be one of the top five players in the country. As a redshirt sophomore, Stidham could apply for early entry into the 2018 NFL Draft, but I'm guessing head coach Gus Malzahn will put on the full-court press to keep him at Auburn now that the coach has re-upped with the school. Stidham has the tools to be an excellent pro, but another year reading and making plays against SEC defenses could help him become arguably the top prospect at his position. A successful junior campaign leading a strong Auburn squad will put him in the Heisman race, as well. NFL scouts are already sure that Herbert is a top talent. He has the prototypical size, arm strength, and mobility to play in any offense. Whether he makes a Heisman run depends on his health and the direction of the Ducks' offense under a new coach, now that Willie Taggart has departed for Florida State. The Bulldogs' senior ball carriers, Sony Michel and Nick Chubb, will be playing on Sundays next season. Swift's been an excellent No. 3 option this year, and should flourish in a featured role in 2018. He's as fast as his name indicates, but also runs behind his pads, and is an excellent receiver. Kirby Smart might continue following the Alabama back-by-committee model if another young player steps up, but that didn't prevent Derrick Henry from winning the Heisman in 2015 -- and Swift is a better overall offensive weapon. Bryant has done an outstanding job taking the reins of Clemson's offense from Deshaun Watson. He's played his best ball down the stretch, scoring 7 TDs (1 rushing) and throwing only 1 INT in the last three games. The team's only loss of the year showed the importance of Bryant to their success, as Clemson fell to Syracuse when Bryant wasn't 100 percent and exited the game after the first half due to injury. He's improving as a passer and has the ability to move the ball on the ground, making the Tigers one of the top picks to return to the playoff in 2018.